My Year of NES has gotten off to a painless start with Capcom's 1988 arcade conversion 1943. 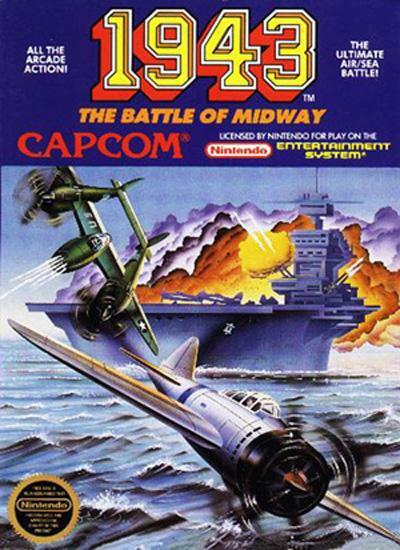 1943 is a video game re-imagining of the Battle of Midway, if the battle of Midway were fought exactly as though it were a generic space shoot-em-up from a mid-80s arcade game. You fly a P-38 Lightning fighter in a series of vertical-scrolling levels. Each level is structured as a mission to destroy either a ship or a large aircraft. Missions generally come in two phases, a high-altitude flight to your target followed by an attack run. Bosses tend to be giant platforms covered in turrets; you blow up the ship by destroying all of its guns. If you strip away the Midway theme, 1943 is barely distinguishable from any other vertical-scrolling shooter. If you replace the sea and clouds in the background with ground and the planes with space ships, you've got Xevious. Each mission begins by giving you orders that tell you the name of the ship you're to sink (accompanied by a morse code sound effect), but the ships are just random names made up by the Capcom staff; none of the targets were actual ships in the Battle of Midway. As is the case in all shoot-em-ups, you're flying a single plane, apparently the last one in the Air Force, against thousands of Zeros, all flying in neat formations that never deviate from pre-defined flight paths. You have a special screen-clearing lightning attack that you can use a limited number of times (taking the P-38's nickname quite literally) and you can upgrade your main gun in a number of ways, including a spread attack. Needless to say, in creating 1943 Capcom did not feel constrained by the theme when making design choices. I had a lot of fun playing this game last week. You turn on the system and you're shooting down planes within 10 seconds. It has a distinct pick-up-and-play factor that's sorely missing from modern games. I can be half-way through the first level in the time it takes me to boot up my PS2 or Wii and navigate to the game start section of the user interface. I can be done with the first boss and on my way to the second before I would have started playing the average current generation video game. It's a challenging game, but it never gets frustrating. The screen never gets flooded with planes and bullets, so it feels like more a test of skill and less a test of ability to memorize where exactly you need to go to survive the bullet hell. This game also raised my self-esteem to the heavens before crashing it down to earth, like a wrestler executing a gorilla press slam. I was able to master the first level with relative ease. The second level was a bit more troublesome, but after a few tries I was able to beat it, and I can now finish the level consistently. The third level has given me more trouble, but I figured I was fairly close to beating it when the week ended. Since this is a Nintendo game, and bound to be short, I figured the game had five, maybe six levels, about standard for shooters in general. I was making good progress towards completion. In preparing to write, I looked the game up on GameFAQs. The more I play the game, the more I like it. Browsing the walkthrough on GameFAQs I discovered that there were a lot of aspects of the game that I had missed (you can hold down the B button to charge attacks, by upgrading your Special Weapon ability you unlock new weapon upgrades for your main gun, etc.). The game's seemingly simple gameplay belies its considerable depth. A final interesting fact about 1943. Capcom is a Japanese company. The game is about the Pacific air war during World War II, and specifically the Battle of Midway, a major defeat for the Japanese Navy and arguably the turning point in the Pacific Theater of Operations. This led to an intersting schoolyard rumor: The game, as released in the US, was a pallette swap of the original Japanese version. In the original, you piloted a Zero against the American fleet, shooting down P-38s and sinking American battleships and carriers. Capcom had changed the names and swapped the images for the American release in order to make it palatable to an American audience. It was intuitively obvious. Capcom's a Japanese company making games for a Japanese audience, and Nintendo of America was very heavy-handed in censoring games brought to the US. How could Capcom possibly have made a game about blowing up the Japanese Navy? But it's all nonsense; you're an American fighting the Japanese in the American version, and you're an American fighting the Japanese in the Japanese version. Realistically, it had to be that way. The goofy lightning special attack makes some kind of crazy Nintendo Logic sense if you're flying a P-38 Lightning; it makes no sense if you're flying a Zero. Capcom made a game about the American side of the Battle of Midway and, whatever led them to make the game, that's what it is, here and in Japan. So, much fun was had this week. 1943 is a good game, particularly if you're a fan of older shoot-em-ups. I'd highly recommend buying it if you should find it and have the means of playing it. I'm going to try rating games on a dollar scale. I'll be setting the maximum amount I'd be willing to pay to own the game, if I didn't own it already. I would say $10 is a fair price for 1943. Considering that NES games on the Wii Virtual Console cost a flat $5, $10 is a pretty strong endorsement. Next week: Batman by Sunsoft. Like 1943, it bears only the loosest resemblance to its source material. Unlike 1943, it isn't worth $10. Finally, here's a MIDI file of 1943's first level music, courtesy of VGMusic.com, created by user JILost. This page contains a single entry by Zach published on February 26, 2007 2:16 AM. Ludology was the previous entry in this blog. My Year of NES, Week 2: Batman is the next entry in this blog.